Make-a-Mosaic is a cute iPad app I downloaded recently. I try to promote apps that are inexpensive and in some way encourage kids to create and learn. Make-a-Mosaic fits the bill. 'Make-a-Mosaic' is a simple educational app which lets children (and adults!) create beautiful mosaic pictures and patterns. 'Make-a-Mosaic' involves the user choosing tiles from 14 different colours and 14 different shapes and placing them on the board to create stunning pictures and amazing patterns. 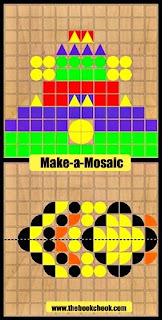 To allow for more detailed pictures and patterns, 'Make-a-Mosaic' also lets the user set the background colour of each tile, allowing each tile to consist of up to two colours. 'Make-a-Mosaic' also features a symmetry mode where the user can create symmetrical mosaics! Kids can elect to create a picture or pattern, play with vertical symmetry or play with horizontal symmetry. You can see two samples I made above left - symmetry one on the bottom. Finished mosaics can be saved to the camera roll. The board can also quickly be cleared, and a new pattern begun. A simple undo option would be nice. There is a transparent tile that will let you change the tile colour, shape and background colour - that needs to be pointed out to kids. What I like: The Make-a-Mosaic app has the "look" of a wooden puzzle set. The colours are appealing. Kids will learn a little about symmetry by playing with the symmetry functions. It's simple to create a mosaic, and fun to play with the various colours and shapes. The options are obvious, and kids will quickly work out what to do. It's a great app to have on your iPad when kids need some downtime, as it's relaxing and gently creative. And the price? iTunes: Currently free $Au0.99. Check out my other iPad Reviews on Pinterest.